I remember Gram used to tell a story about a real Shoemaker and the Elves, but I can’t remember the details any longer. Maybe Auntie Kat remembers? It was a true story and maybe involved red boots. ??? 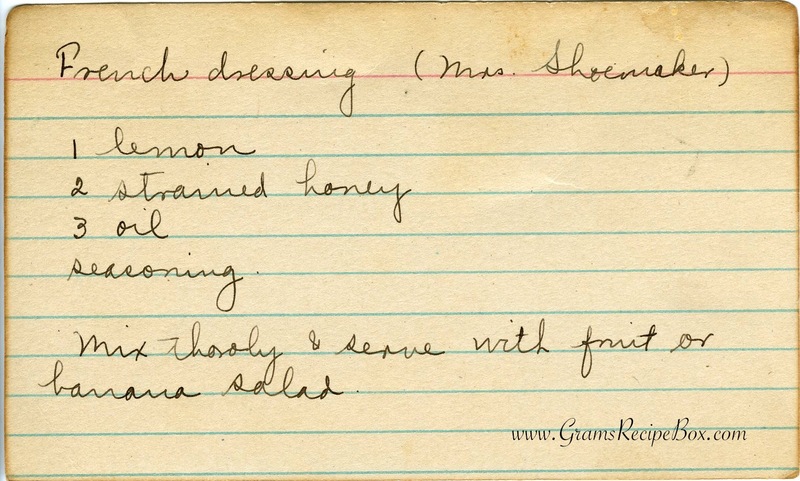 I was reminded of that story because this recipe was provided by Mrs Shoemaker, whoever she may be. I’m guessing this is a recipe of equal parts, e.g. 1 part lemon, 2 parts, honey, 3 parts oil. The seasoning is a mystery, what ever it is. Salt and pepper? « Please vote for me! Very vague recollection of this story. I’ll have to see if it is in the story book. Only maybe there. Maybe GrammaA has a thought on the Shoemaker and the Elves. No recollection on Shoemaker, Elves or Mrs. Shoemaker. I have a thought…but it’s not about elves or red boots. What is strained honey? And why does it need to be strained? Is this honey that is straight from an angry bee and might have pits of hive stuff still in it? I do have recollections of The Shoemaker and the Elves, but I’m not sure the shoes the elves made were red boots. Diane that was a good question. I did a search on strained honey, and apparently if the honey is freshly collected, or you have the comb, you would want to strain it so that no wax or other particles remain in the honey. Learned something else new today!